Church records from 1830 to 1848 have long been sketchy. Now, after seven years, a massive fifty-volume membership record nears completion. Although the Lord commanded the Church as early as April 1830 to keep a list of members (see D&C 20:81–83), the records of the early Church lack a “regular list of all the names of the whole church.” (D&C 20:82.) For years, this lack of information has frustrated the posterity of the early Saints. Essential information such as baptisms and confirmations has been unavailable, and temple work for many of the early Saints has not been completed. Because of the unavailability of statistics, historians have even resorted to making broad “guesstimates” about Church membership﻿—statements such as “7,000 to 15,000 people fled Missouri” are prevalent in historical circles. The need to gather this crucial information led to a recently completed six-year project to compile a membership list of the early Church members. Through financial support from the Religious Education area at Brigham Young University, and from private donors to the LDS Foundation, our team of researchers has been able to find and comb journals, biographies, dissertations, historical and genealogical records, periodicals, minutes, census records, ship lists, church and land records, rosters, cemetery records, tax and property lists, and civil records in North America and Europe. We spent day after day at Church historical sites searching for tombstones, court documents, and local histories. Hundreds of hours of interviewing descendants, examining family memorabilia, and recording family traditions helped establish the identities of early members. The first result of the study was the development of a membership list. This list comprises a fifty-volume compilation numbering approximately fifty thousand pages. It is called Membership of The Church of Jesus Christ of Latter-day Saints, 1830–1848. Brigham Young University recently gifted the compilation to the Church for microfilm use. As such, it will be published by the Church and made available to local LDS family history libraries. The compilation attempts to reconstruct something of the Church activity of each member of the Church from 1830 to 1848. It is organized in alphabetical order, beginning with Abiel Abbott and ending with Thomas Zundle. The information on each member is divided into four sections: vital statistics, Church ordinances, temple ordinances, and biographical information. A vital step in developing the early membership list was to design a computer program that would accurately analyze and interpret the wealth of information. Jim Rosenvall and his colleagues at Brigham Young University’s Computer Services wrote a program that can store, index, search, and analyze vast quantities of data on the early Saints. No longer need we rely on undocumented generalities in our research in family and Church history. For example, we now know where the Saints of 1830–1848 were born. (See Chart 1.) About 25 percent of the early Church members were born in the British Isles. 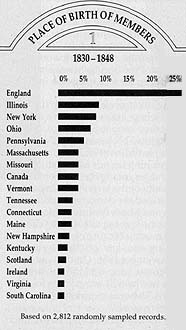 The second-largest group of early converts came from proselyting efforts in New England and New York. Not surprisingly, the primary areas of gathering in New York, Ohio, Missouri, and Illinois show numerous births﻿—the beginnings of a second generation of a convert church. We know which years account for the greatest numbers of baptisms. (See Chart 2.) 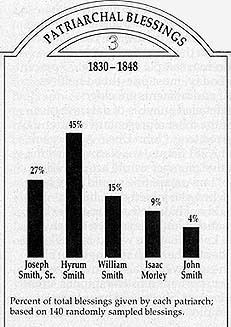 On the basis of random sampling, it appears that over half of the membership of the first eighteen years of the Church joined after the deaths of Joseph and Hyrum Smith. Apparently, the persecutions of 1837 and 1838 did not stop membership growth. However, a greater growth occurred during the more prosperous and peaceful era of Nauvoo. We know which early patriarchs gave the most blessings. (See Chart 3.) On the basis of 140 randomly sampled patriarchal blessings, Hyrum Smith accounted for the greatest number, followed by his father, Joseph, Sr., and then his brother William. This is surprising because Joseph Smith, Sr., served as patriarch for seven years, Hyrum for three years, and William for less than six months. The balance perhaps reflects Church growth, which was greatest during the terms of Hyrum and William Smith. We know which office in the Melchizedek Priesthood male members held when they received their endowments in the Nauvoo Temple. (See Chart 4.) The random sample shows that 73 percent were seventies. Today, most priesthood holders who receive their endowments are elders. With a more detailed anaylsis of data, we can make a profile of the most representative Latter-day Saint, often referred to as “John Doe.” After examining statistics of 3,781 Saints, we discover that the most representative member would actually have been “Mary Doe,” a woman. She would have been thirty years old when she joined the Church. Because she would not have left a journal, her biographical information would have been sketchy. However, we do know that she would most likely have been a resident of Lancashire, England. She would have been employed as an impoverished blue-collar worker, perhaps a cotton spinner, dressmaker, or housekeeper. She would have been baptized while employed, and many members of her extended family would have joined the Church about the same time. A major purpose in developing a membership list was to extend the blessing of temple ordinances to the early Saints. Through the identification of early Church members and the cooperation of the Family History Department of the Church, thousands of ordinances have been completed, and thousands more are in the process. To me, completing the temple work for the early Saints has been the most significant outcome of this project. We found that the records of baptism for approximately 25 percent of the Saints were missing. 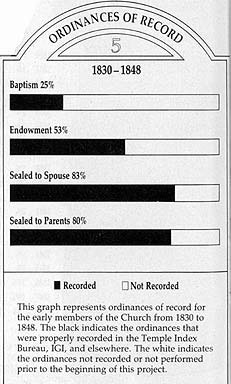 Many had not received the temple ordinances or had not had the information recorded. (See Chart 5.) Of the early Saints, we found that 47 percent needed to receive their endowments, 17 percent needed to be sealed to their spouses, and 20 percent needed to be sealed to their parents. A great many Saints had missed the blessings of temple work. This included those who had not emigrated or who were less-active, as well as many of the pioneers and the members who had valiantly suffered through the persecutions. Many whose work we would suppose had been completed had not received all of their ordinances. (See Chart 6.) For instance, we know the names of 83 people buried in the Parley Street Cemetery, Nauvoo’s main cemetery. Many of these people had helped to build the temple there. For the 83 people, 104 temple ordinances remained uncompleted. As another example, an astonishing 1,598 ordinances still needed to be done for the 1,403 pioneers who crossed the plains in 1847. This project to compile and analyze the membership list has been a labor of joy for all those who have assisted in it. We have shared a wonderful, spiritual experience identifying each departed member and noting the significant events and contributions of his or her life. And we have felt deep love for those members as we have attended the house of the Lord to perform temple ordinances in their behalf. Based on 2,812 randomly sampled records. 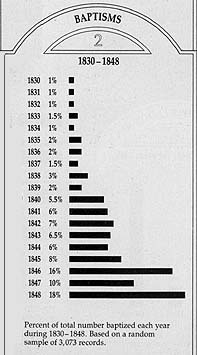 Percent of total number baptized each year during 1830–1848. Based on a random sample of 3,073 records. Percent of total blessings given by each patriarch; based on 140 randomly sampled blessings. 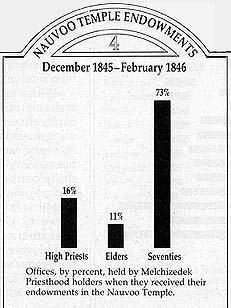 Offices, by percent, held by Melchizedek Priesthood holders when they received their endowments in the Nauvoo Temple. This graph represents ordinances of record for the early members of the Church from 1830 to 1848. The double line indicates the ordinances that were properly recorded in the Temple Index Bureau, IGI, and elsewhere. The single line indicates the ordinances not recorded or not performed prior to the beginning of this project. This chart indicates the number of people involved in the group and the ordinances still needing to be performed prior to the beginning of this project. For example, 83 people were known to be buried in the Parley Street Cemetery. Of the 83 people, 104 ordinances still needed to be completed in their behalf. 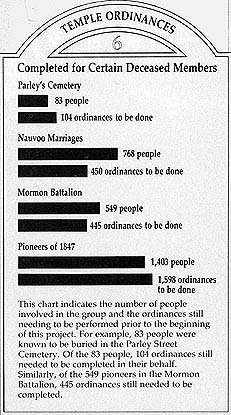 Similarly, of the 549 pioneers in the Mormon Battalion, 445 ordinances still needed to be completed. Susan Easton Black is associate professor, Department of Church History and Doctrine, Brigham Young University. She serves as Relief Society president of the BYU Eleventh Stake.